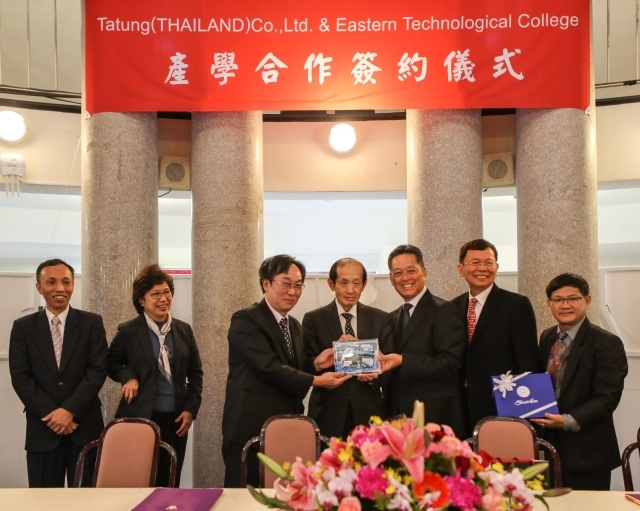 Tatung Thailand today announces that it will collaborate with Eastern Technological College of Thailand for an industry-university project, which includes talents training in research, design, management, and manufacturing. Contract signing ceremony was held earlier today with the chairman of Tatung Thailand Co., Mr. M.Y. Hsieh, and the president of Eastern Technological College of Thailand, Dr. Prasert Klinchoo signing the contract, together with the presence of the director of Tai Trade Office, Ms. Nannatee Wiboonchutikula, the chairman of Tatung, Mr. W.S. Lin, and the president of Tatung University, Dr. M.G. Her. Tatung Thailand Company is the reginal office of Tatung for the market of ASEAN. The Company has been in Thailand serving its clients in South-Eastern Asia for nearly 30 years. Its business encompasses electric scooters, substrate processing, and the sales of cable, industrial appliances, motors, home appliances, and air conditioning. In the future, Tatung Thailand will also be the business hub of Tatung Group for smart grid system, energy saving as well as solar system. Through the means of collaboration with technological colleges, Tatung Thailand not only can expand business but also accommodate its need for local professionals. Thailand is a country with abundant natural resources and long duration of sunshine, yet with high power rate. Adding the fact that the Thai government has been promoting the policies for “Thailand 4.0” and green energy industry makes Thailand in particular suitable for the development of solar power to be self-sufficient. The chairman of Tatung, W.S. Lin, said that new southbound policy has been the main action item for Taiwan government to promote. With its pivotal position in economy and trade, the Thai government in recent years has been also further promoting smart city, Thailand 4.0, and eastern economic corridor. Tatung has been a company full of solutions and experience in infrastructure for energy, and smart solutions for communities and industrial applications. The industry-university collaboration project will benefit the Company on the cultivation of local talents and expand the market in Thailand thus further prepares Tatung Group for ASEAN market. The chairman of Tatung Thailand, M.Y. Hsieh, also pointed out that industry and university can both benefit from the collaboration project. More local talents will be needed under the new southbound policy. Tatung Thailand has plenty industrial experience to equip the students with professional know-how which in turn will enhance the penetration of local market for Tatung Thailand and hopefully facilitate the ASEAN market for Tatung Group.